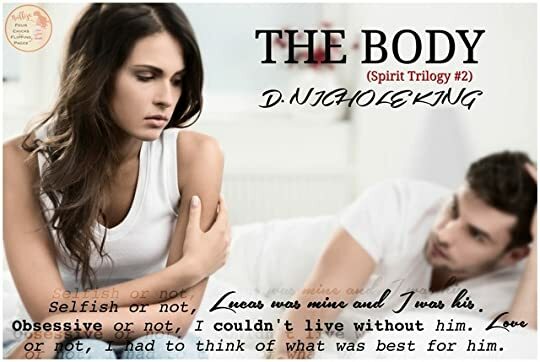 The Body was such a perfect breathtaking sequel to The Spirit. It was heartfelt and more addicting than book 1. Again Lucas and Carrie’s love story was touching and sweet. I love how they live for each other. Yes Lucas may be dead, but with Carrie he felt more alive than he ever did. Together they loved each other the best they could. Even if they couldn’t go all the way with their desires for each other, they loved with all their hearts. They were connected in every way possible, heart, mind, body and soul. Even in death they couldn’t stay away from each other. Each and every page of this wonderful paranormal romance, sucked me in more and more. Not only because of the couple, but because of their wonderful friends. Of course I could never forget Jessica, who did anything and everything for her best friend Carrie. These group of friends Megan, Jessica, Mike, Reed and Lucas went through hell and back to save the person they love most… Carrie. Carrie was loving and the most wonderful person anyone could have as a friend, but being her friend wasn’t an easy task. Her life wasn’t normal and her friends weren’t normal. Anyone who is into this beautiful paranormal romance with full of adventure, friendship and so much love, this book is for you. Believe me, you will fall in love with this beautiful love story, because I definitely did. I can’t wait for book 3…I’m counting the days. The Spirit was captivating, sweet and addicting. Carrie Ann’s story pulled me in quick and I couldn’t stop reading once Lucas came into the picture. They were two souls meant for each other and once their world collided, they couldn’t let go…even if they wanted to. Carrie Reese has been just any 17 year old girl and a person who didn’t believe in ghost, but all that changed once she met Lucas. Lucas was perfect, he was beautiful, he was any girl’s perfect guy. Carrie’s summer would have been a boring one, if it wasn’t for her new man Lucas and her new town with demons and ghosts, it would just be any other summer. But with so much going on and with Lucas’s life on the line, their time together could be running out. Will Carrie help Lucas find his soul and crossover? Or will they find a way to stay together. Read and find out. This beautiful story of Carrie and Lucas, was refreshing as this is my first ghost love story and I loved it. It was sweet, it was interesting and super addicting. I cannot wait to dig into the next book in the series.